India is a land of fairs. Fairs are very common in India. In almost all parts of the country fairs are held. Some of them are religious, some are commercial and some are social. 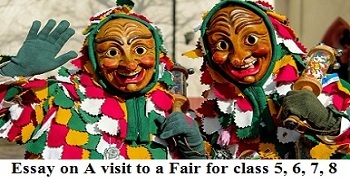 Some fairs are held annually or six monthly at their scheduled times and places. Last year in the month Kartik, I with my four friends went to Garhmukteshwar to bathe in the hold Ganges. It is one of the oldest fairs of Uttar Pradesh. We went there by bus and reached there within four hours. First of all we made arrangements for our lodging. After this we went to take bath in the Ganga. We took our food after a short rest. We decided to visit the market. It was chiefly a rural fair. There was a good arrangement of police, Seva Samiti and scouts. In the fair shopkeepers had come from various rows. Generally shops of one kind were arranged in one row. On one side there were shops of confectioners. On the other side were shops of steel utensils and iron boxes. The there were shops of different kinds of clothes, toys, blankets, carpets, books, shoes, wooden articles, handloom clothes and other things of daily use. They were well-decorated. Besides shops, there were hawkers who moved about up and down the fair and sold their own little products. The roads were well sprinkled with water and as such there was no dust. There were theatrical and cinema companies also. There was a circus show. We went to see it on payment of three rupees. There were many lions, tigers, elephants and other animals which showed their amusing tricks. We also purchased many things. We again went to the river and took our bath. There was a great rush of the people at the ghats. People were bathing in the river. The water had become dirty. Now the evening was drawing nea and we were tired. So we returned to our place. Next day we came back. The fair has got its utility. It is a boon to the villagers. It is a good place for advertisement and propaganda. It also provides amusement.